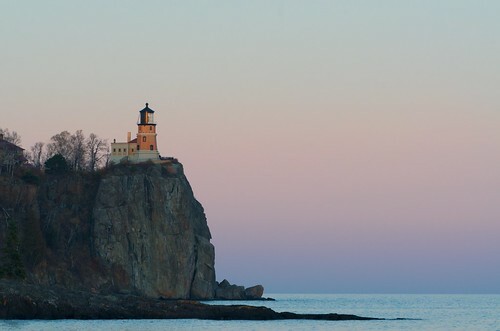 Tales of a Minnesota Geek » Blog Archive » Photo of the Week – Split Rock Lighthouse – Again! Photo of the Week – Split Rock Lighthouse – Again! Split Rock Lighthouse – Again!, originally uploaded by pmarkham. Split Rock Lighthouse is one of my favorite places in the whole world. I took this photo nearly a year ago from Pebble Beach on the state park side of the Split Rock property. This is at sunset, just as the last rays of golden hour sunlight are washing the top of the lighthouse while leaving the cliff and the lack in deep shadow. I also got a nice pink glow in the sky to finish off the scene. I never get tired of this place.